Years ago when I was majoring in environmental science at Ramapo College in northern New Jersey, I took a class that dealt with how to create energy-efficient homes and structures that was called Design With Nature. We learned how to use things like the angle of the rising sun for natural heating, and how to work with the natural landscape instead of bulldozing and tearing down. I've always felt drawn to the natural world, and I chose to make my home in the Adirondack mountains where I'm surrounded by millions of acres of mountains, forests, lakes, and rivers. So when it comes to designing beading projects with nature themes, I'm all about selecting beading supplies that help me capture and portray the beauty of the natural world around me. I've got an endless supply of inspiration just from the views out of my dining room window, and the more time I spend outside observing, the more ideas I get for creating beaded jewelry with themes from nature. Natural materials like stones and seeds are probably the first thing that come to mind when planning a nature-themed beaded jewelry design. Beads made out of bone, horn, and wood will also lend a very organic feel to your beading projects. If you want to get a little crazy with your natural beading designs, why not include something like fish leather as a base for bead embroidery or beaded components? An easy way to add a little bit of natural beauty to your beaded jewelry designs is to include pressed glass shapes like leaves and flowers. 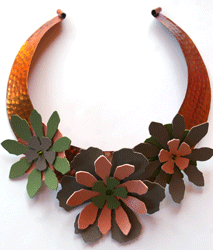 And of course, there are lots of options if you choose to use Lucite beads and flowers in your designs! When it comes to colors to enhance your natural beaded jewelry designs, mattes and opaques are my first choice for capturing the beauty of the natural world. Earth tones like green, brown, blue, yellow, and orange also play a big part in my nature-themed beaded jewelry designs. When it comes to choosing your seed beads, don't forget that the lovely, organic shape of some of the Czech seed beads is perfect for creating a more natural look for your beading projects. Save the cylinder beads for designs where precision is more important, and break out those jars and bags of "wonky" beads that you've culled from years of bead stitching for projects where you want a softer, more natural feel. To Sparkle or Not to Sparkle? There are most definitely places in nature-themed beadwork to add a handful of crystals, or even a particularly striking crystal pendant or stone. The trick with using crystals in your nature-themed jewelry is to use just enough to give a little sparkle, and not to overwhelm the piece. Look to crystals when making beaded jewelry that captures the beauty of a fresh snow fall, or your favorite water source like river, stream, lake, or ocean. 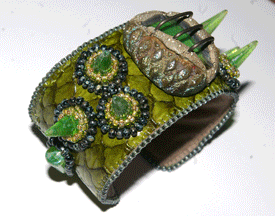 Of course, all of your favorite bead-weaving stitches can be used to create nature-themed jewelry. Embellishments like stick fringe or leaf fringe can also make your favorite beading projects feel more "natural". Sculptural beading projects are also a great way to bead with nature, as well as a great way to master stitching skills like tension, increasing, and decreasing. 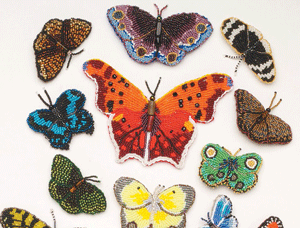 Refine your bead stitching skills, and make 10 sculptural beading projects inspired by nature when you download your copy of Beaded Butterflies and More: 10 Sculptural Projects Inspired by Nature. Whether you want beaded embellishments for accessories like handbags, clothing like jeans and jackets, or to make striking beaded jewelry, you'll find something inspiring in this eBook! What's your favorite way to bead with nature? Leave a comment here on the Beading Daily blog and share your favorite nature-inspired beading supplies, tips, and techniques with us!